No. 11 Virginia Tech (18-3, 7-2) returns to Cassell Coliseum on Monday night for a Big Monday matchup with the No. 16 Louisville Cardinals (16-6, 7-2). Both teams have had very good seasons in conference play thus far, and both will be looking to move to 8-2 in order to stay within striking distance of conference leaders Duke, UNC and UVA, who each have just one loss in the league. 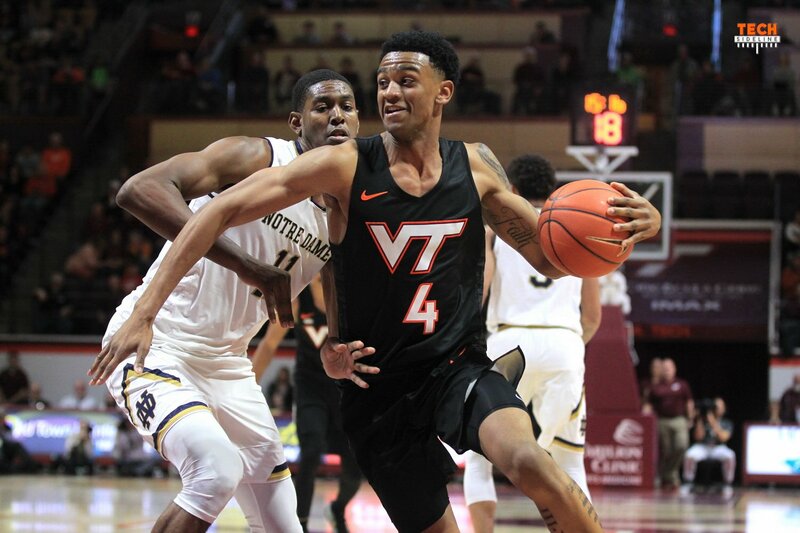 The Hokies are coming off a historic 47-24 victory on the road against NC State despite the absence of injured starting point guard Justin Robinson. They’ll have to play better on the offensive end against the Cardinals, because it’s unlikely that 47 points will be enough for the second game in a row. Under new head coach Chris Mack, Louisville had won six games in a row until their home 79-69 defeat at the hands of North Carolina on Saturday. They’ll be looking to get back on track against a Tech team that will likely be without Justin Robinson again. They’ll see the Hokies as vulnerable because of Robinson’s absence, and they’ll regard it as a must-win game, especially when you look at the other games coming up on their schedule: at No. 22 Florida State, and home against No. 2 Duke. They also still must play No. 3 Virginia twice. Since conference play began, Louisville also beat No. 7 UNC 83-62 in the Dean Dome, though the Tar Heels returned the favor this past weekend. The Hokies force a lot of turnovers, and believe it or not they are fourth out of 15 teams when it comes to preventing offensive rebounds. Louisville has a depth advantage against Tech, as most teams do. Let’s take a closer look at Louisville’s personnel. G Khwan Fore (6-0, 185, r-Sr.): 3.7 ppg. Fore isn’t much of an offensive threat, but he’s started 50% of Louisville’s games. He’s a transfer from Richmond. G Christen Cunningham (6-2, 190, r-Sr.): 10.4 ppg. Cunningham leads the team with 96 assists. He is a transfer from Samford. F Dwayne Sutton (6-5, 215, Jr.): 10.6 ppg, 6.9 rpg. Sutton is a quality player who is a transfer from UNC Ashville. F Jordan Nwora (6-7, 225, So. ): 17.9 ppg, 7.7 rpg. Nwora shoots 40.2% from three-point range. C Malik Williams (6-11, 245, So. : 8.1 ppg, 5.3 rpg. Williams leads the team with 32 blocks. 60% of Louisville’s projected starting lineup are transfers from other programs. They also bring a key transfer off the bench. Center Steven Enoch, who averages 9.3 points and 5.3 rebounds per game, is a transfer from UConn. We could also see Enoch in the starting lineup instead of Malik Williams. If that’s the case, then 80% of Louisville’s starting lineup will be transfers. Generally speaking, the road team is at a disadvantage in quick-turnaround games. Louisville’s game against North Carolina on Saturday started two hours later than Virginia Tech’s game with NC State, and they had to travel to Blacksburg on Sunday evening. However, with Justin Robinson probably missing the game, all bets are off. As a side note, Louisville is the only current ACC team that Virginia Tech has not defeated in ACC play. The Hokies are 0-5 against the Cardinals, though most of the games have been high scoring and close. Tech hasn’t beaten Louisville since a 72-56 win in Blacksburg on February 13, 1991 when both teams were still members of the Metro Conference. So UL is #16 in the country starting transfers from those basketball powers UNC-Asheville, Samford and Richmond . . . . hmmmmm . . . .
Yea and their efficiency ratings are impressive and coach Mack has won everywhere. They are legit. Sounds like Mack might be a damn good coach. Taking a bunch of transfers from ‘lesser’ programs and having a lot of success.